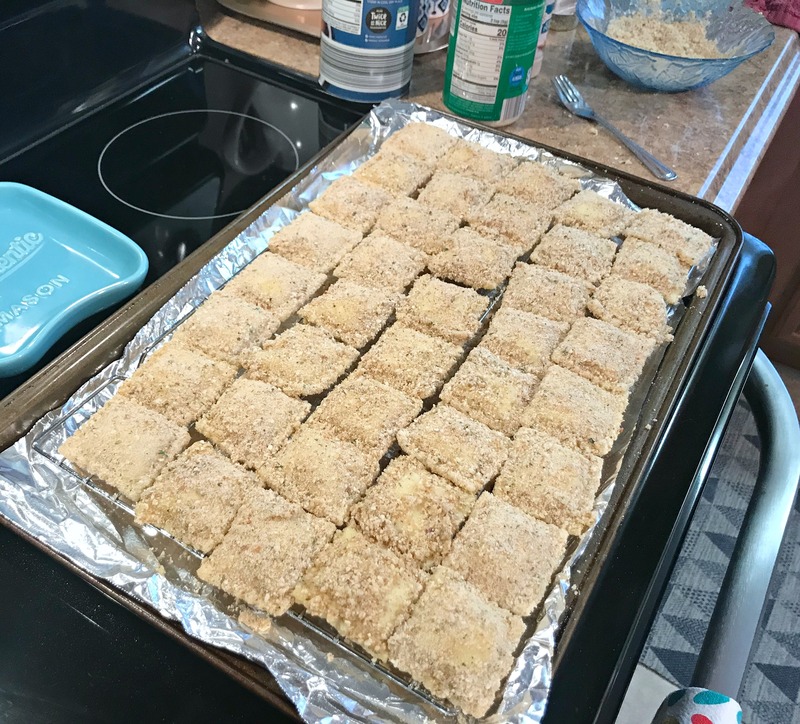 My mom’s recipe for toasted ravioli is a long time favorite of mine, but one I don’t make often. The original method can be time consuming if you have a lot of ravioli to toast, a small skillet or both! 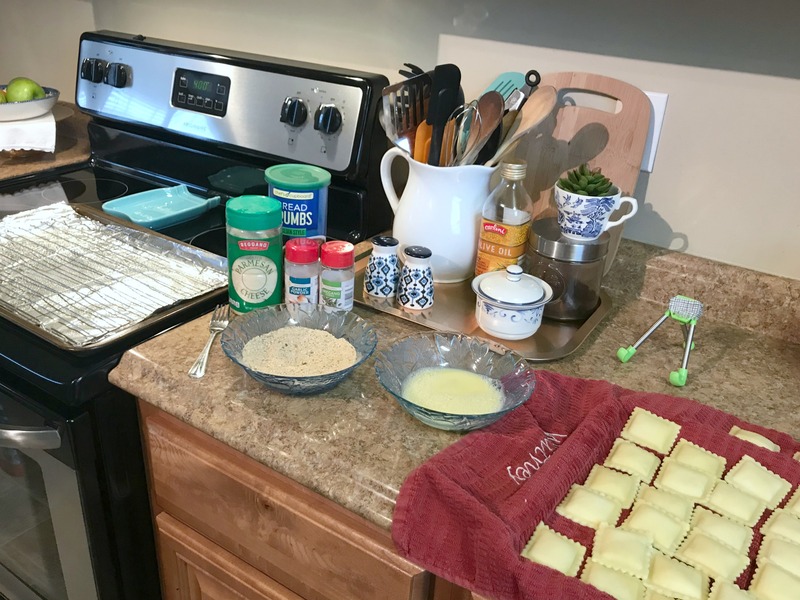 Since she’s had such great success taking things that are normally toasted, fried or cooked in a skillet and toasting/cooking them in the oven, I decided to try the oven method with the ravioli recipe. It was a success! It still takes time to prep the ravioli for the oven, but it’s really nice that they all cook at the same time. While they’re in the oven you can clean up the kitchen, make the sides and set the table! I’ll give you the recipe first and then follow with step by step photos. Preheat the oven to 400 degrees. 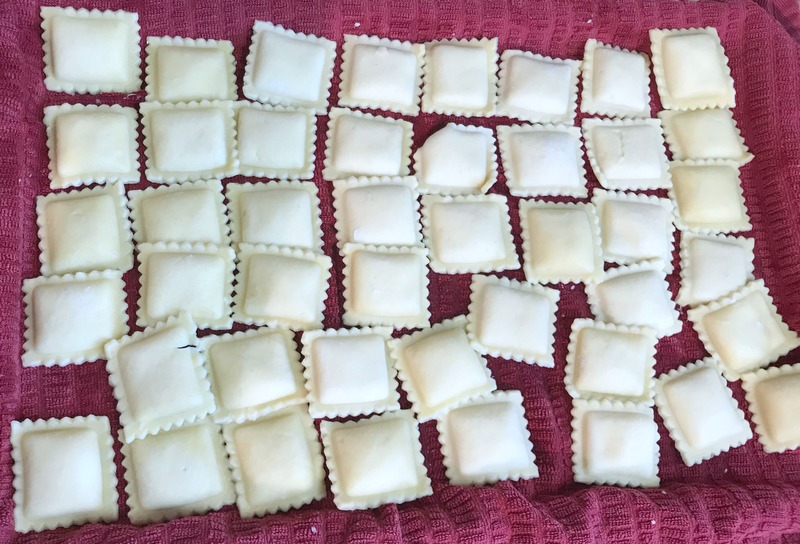 Remove ravioli from the freezer and allow to defrost in a single layer. I lay mine out on a cookie sheet lined with a dish towel. If the pieces are stuck together, rinse them with hot water and carefully, slowly allow them to separate. Don’t pull them apart, just let the water naturally defrost and separate the pieces. In a shallow bowl, combine bread crumbs and parmesan cheese with a little salt and pepper. In another shallow bowl, beat the egg and then add the milk. Line a cookie sheet with foil. Place a wire rack on top and spray it liberally with cooking spray. Make an assembly line so you can dip one ravioli in the egg wash, coat it with the bread crumb mixture and then place on the wire rack. 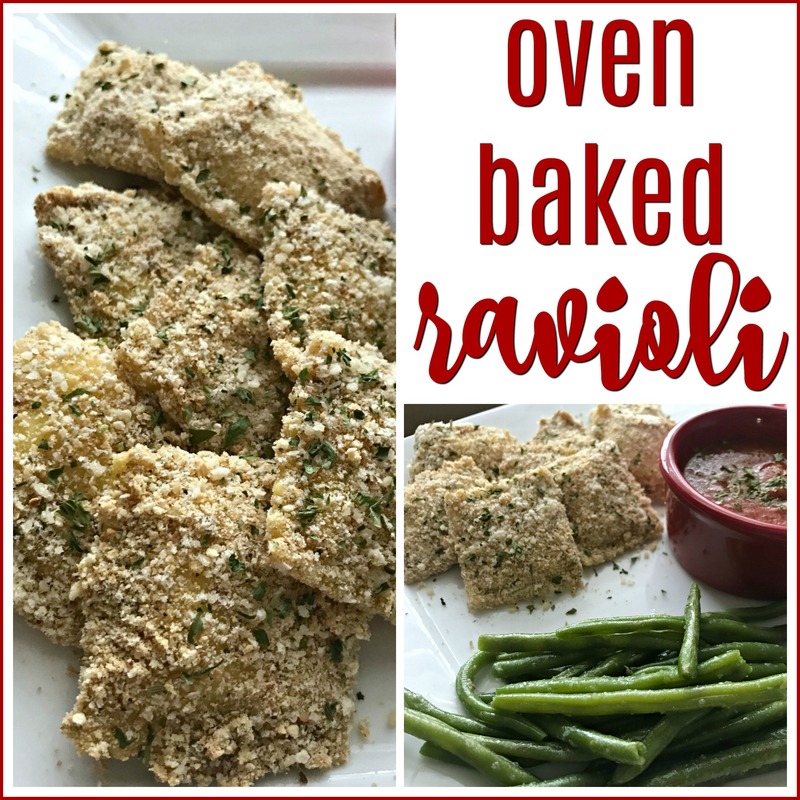 Once all the ravioli is coated, bake at 400 for 15 minutes or until the bread crumbs are slightly golden brown. 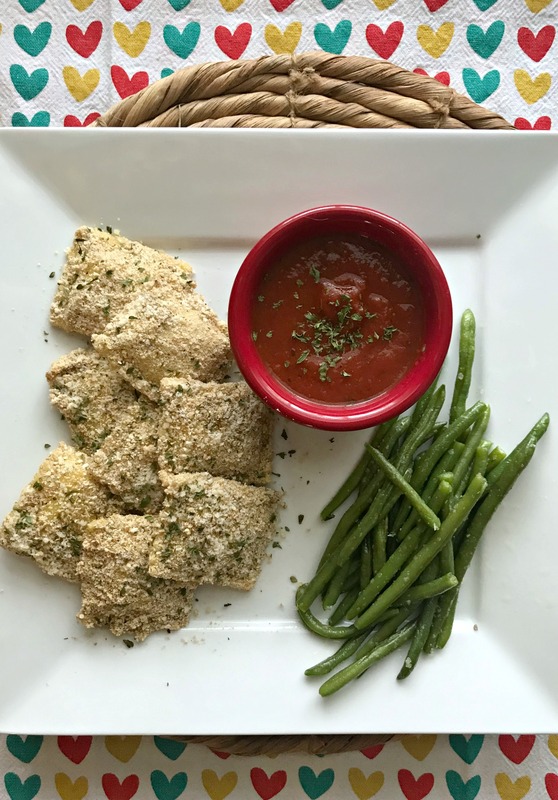 These are really good with a side of pizza or marinara sauce – I love the jars of Rinaldi pizza sauce from the Dollar Tree. 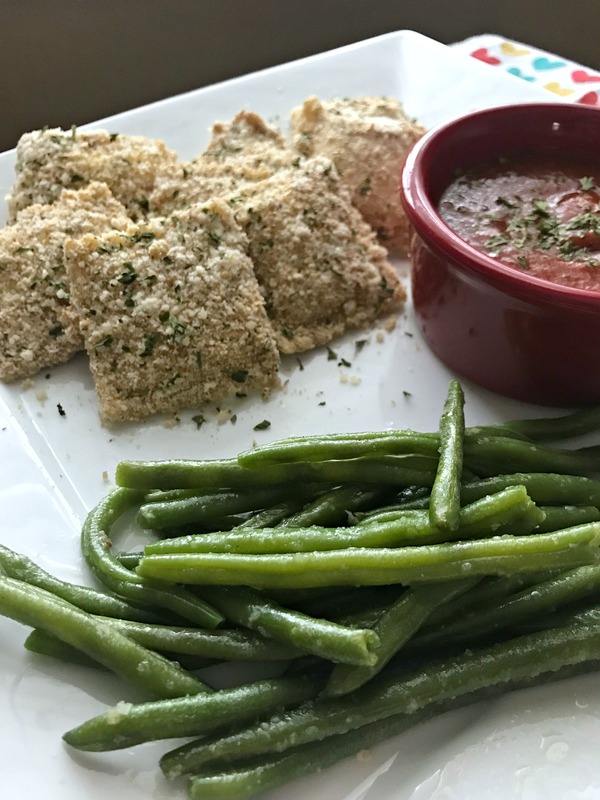 I served my toasted ravioli with Garlic Green Beans, another family favorite! Let’s be honest – the original recipe delivers a truly “toasted” ravioli, and anything tastes better when it’s fried. 🙂 But this method is still delicious while being healthier and requiring less hands-on time. So that’s a win for me! I hope you’ll try this recipe and let me know if you enjoy it! Yum! I’ve never had toasted ravioli. It’s so pretty and seems like it would be fun to dip in sauce. It makes a nice appetizer or addition to another Italian dish, and it’s also great as the main entree! I’m thinking Kevin’s not a big pasta fan so this might be something he would like as a side? Looks delicious! I will be saving this to try soon hopefully!